Some travel aloft on sky-ships, held aloft by arcane sigils and enchanted luftwood. Others prefer the more portable broomstick, or the well-crafted magic carpet. Other even transform themselves into birds, or entice wyverns into their service. On the Coin, means of subverting the ancient divine edict against mortal flight are as many and varied as the peoples who practice them. 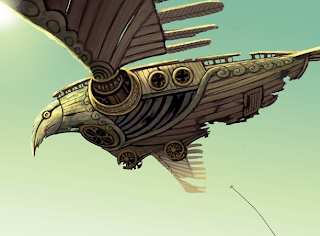 For the discerning traveler, however, one flying vehicle stands above them all - the Mynacean ornithopter. Drawing on the mechanical ingenuity of Mynacean philosophers, the ornithopter lifts itself aloft on wooden wings. While some draw on arcane power or bottled lightning to power their wings, others simply rely on slaves or conscripts to provide their motive energy, commanded by the beat of a drum. It is this reliance on mortal drive, rather than mystical energies, that makes the ornithopter a truly remarkable aether-craft. A well-built and fully crewed ornithopter can achieve speeds of up to 20 leagues an hour, making distances between the city-states vanish. However, they cannot fly for long before their crews tire, meaning over-ocean trips are strictly limited. Capacity for cargo is relatively limited, but they still carry messages and small cargoes of valuable or perishable goods between city-states. A small ornithopter capable of carrying five humans (at least two must have a Str of 14 or more) will set you back about fifty thousand gold drachma, while anything much larger will need to be commissioned from an ornithos at enormous expense.